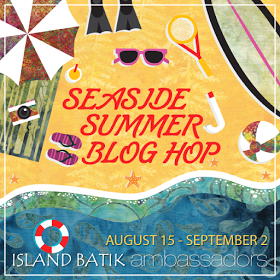 It's time for my first blog hop as an Island Batik Ambassador! I had a blast making my quilt for this event! I ended up using all the fabrics from the collection to make some really fun fish! 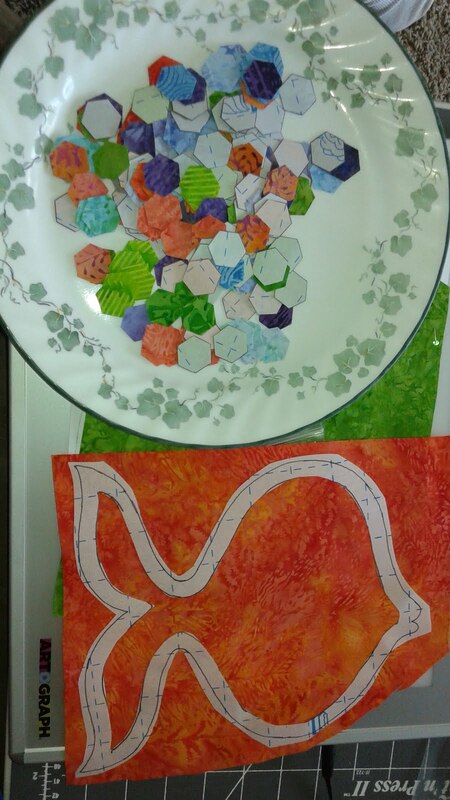 I started by cutting out a lot of really tiny (3/4 inch) hexagons using every fabric in the collection. I also designed a fish and picked three fabrics to be the fish. Then I got to work putting the hexagon scales on the fish. I had a lot of fun quilting this quilt in a hexagon design! And whatever other veggies you have! Cut all veggies, salami, and mozzarella into small pieces. Cook pasta following directions and run cold water through the pasta while it's in the strainer to cool it. Mix all ingredients and about 1/2 a bottle of Italian dressing together and let sit for at least 1/2 hour. Enjoy cool. I love to go to the local farmers market and buy all these ingredients fresh in the summer. It is a large recipe, so you may need to scale it down. Here is the complete lineup for the blog hop! Be sure to check out all the other fantastic quilts the Island Batik Ambassadors have been creating,. Adventurous Applique and Quilting - That's me! Today is the Day! I'm officially Published! Today is the day! 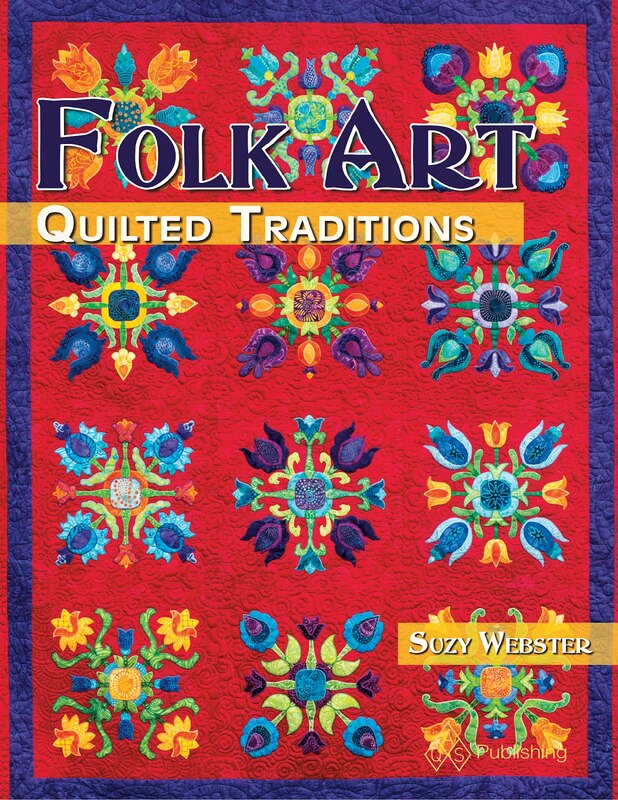 Folk Art Quilted Traditions in HERE! It's available! I am SO thrilled. When I started working on the idea for this book two years ago I had no idea what path it would end up leading me down. It has opened a lot of doors and lead to exciting new adventures. Almost exactly a year ago, after a year of work, I sent off a book proposal to the American Quilter's Society. Two of my wonderful teacher friends had read and helped me edit the proposal and all that was left to do was to put the box in the mail and keep my fingers crossed. Six weeks later (and after checking my email thousands of times), there was an email from AQS. They'd accepted my proposal! I was sitting in the teacher's lounge when I read it and I screamed. My comment was, "They accepted my book proposal! I have to go call my mom!" I felt like I'd won the world series and was headed to Disney World. After coming off cloud nine I realized I had about 3 and a half months to get the manuscript and projects done and in AQS's hands. It was a big task, but my wonderful mother Kathy was ready to dig in and help. I'm not sure I'd have made it without her! Thank you mom! 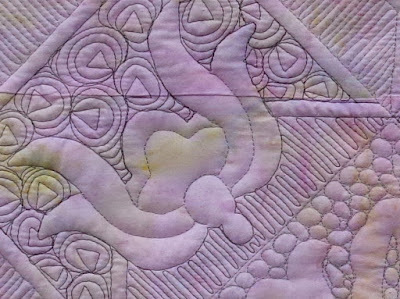 So now, you too can learn my method of applique and have a blast picking out your own fabrics and creating a beautiful quilt, table runner, or bag. If you do, please be sure to share your creations on my Machine Applique Adventures Facebook group! 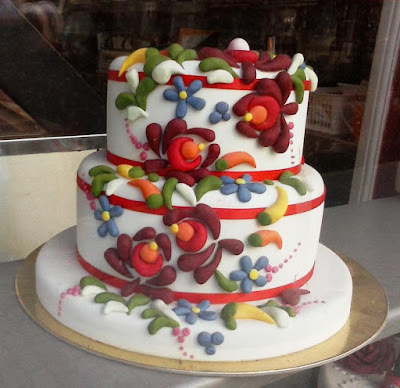 I love to see what other's create with my patterns. They all look so different. Here are three versions of the same block from the book. I love them all, but they sure look different from each other. I must admit that some time soon I'm going to have to go to my local Barnes and Noble and see if it's on the shelves. What fun! My grandfather's first cousin still lives in Hungary and sent me this picture the other day because it reminded him of me. I would LOVE to have this cake today to commemorate the book and Hungarian Folk Art! 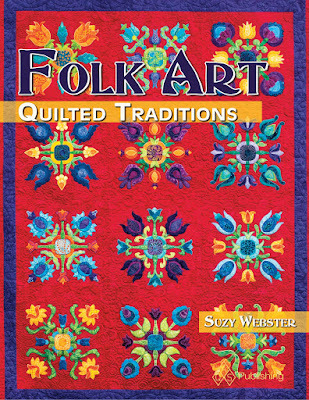 Labels: American Quilters Society, Folk Art Quilted Traditions, Published! I just bought new eyeglasses. The display rack had this cool tile pattern! It would make a fabulous setting for a quilt. I also really like the colors. 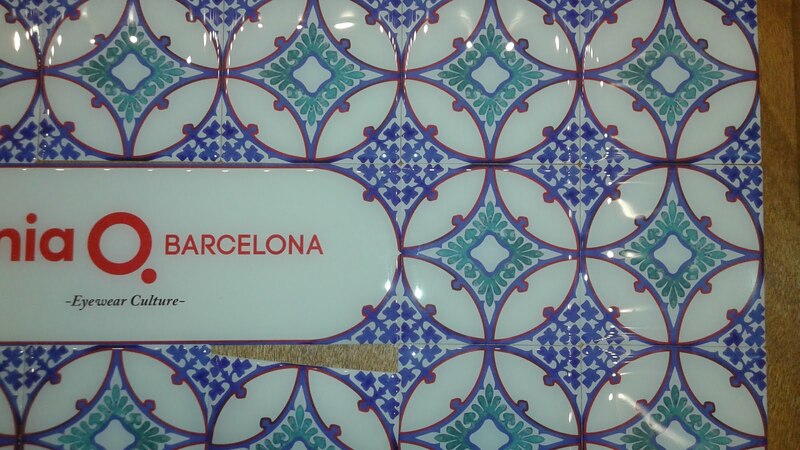 And it does remind me of Spanish tiles. I took this picture in a movie theater. 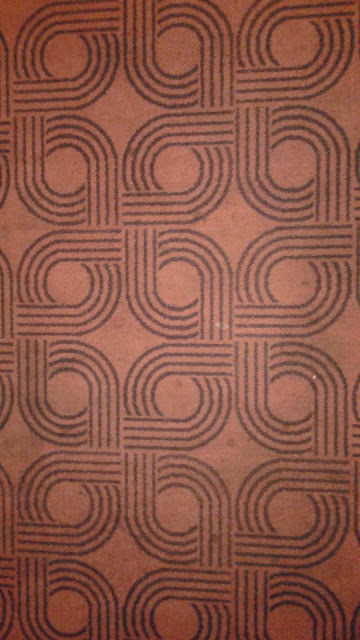 It's the carpet. It would make a great quilting pattern if I could figure out how to stitch it continuously. 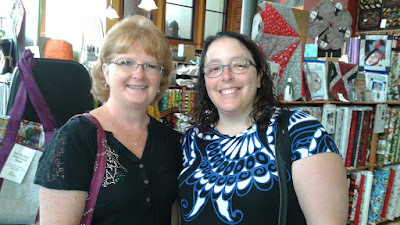 Meeting my Fellow Minnesota Island Batik Ambassador! 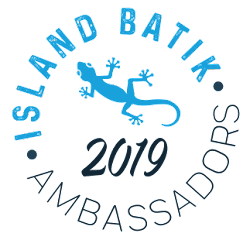 Today I had the opportunity to meet one of my fellow Island Batik Ambassadors from Minnesota Vicki. Where to meet? Duh! A quilt shop. The fantastic All in Stitches in Zumbrota, Minnesota. I haven't been there in three months and I was itching to go back. Check out Vicki's blog Vicki's Crafts and Quilting. 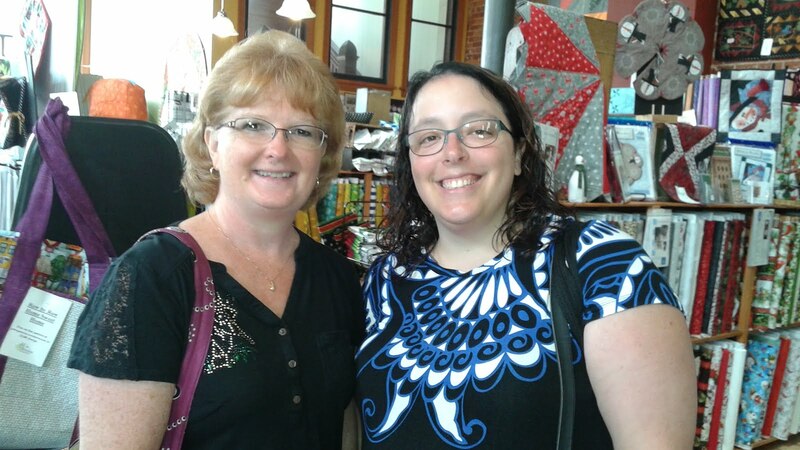 Besides both of us being from Minnesota, the other reason we were meeting was so that I could give her a copy of my new book Folk Art Quilted Traditions so she can work on a project for me! I can't wait to see what all my bloggy friends create from my book. 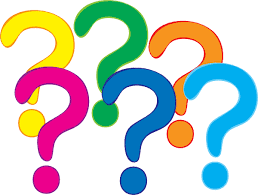 The blog hop will be October 10-14! Make sure you come back and check it out. 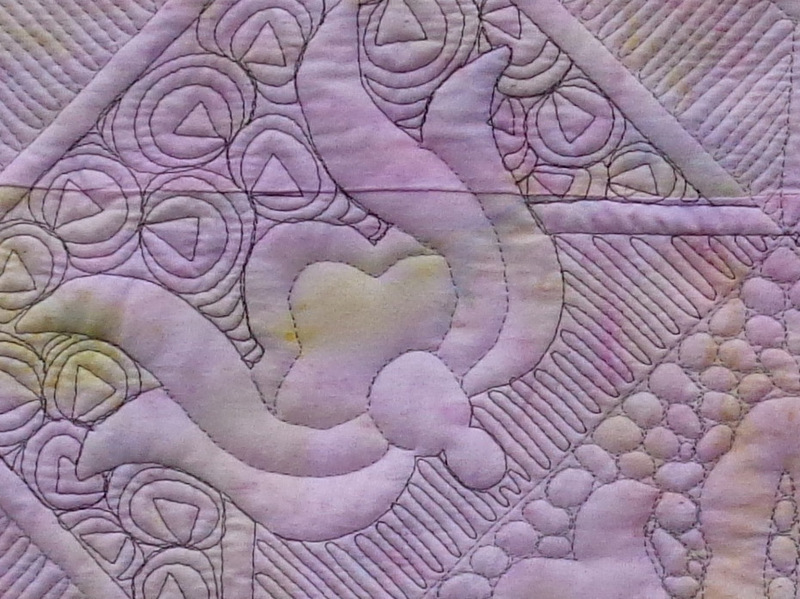 And here's a peak at the back of my new show quilt that will debut at Quiltweek Des Moines in October. 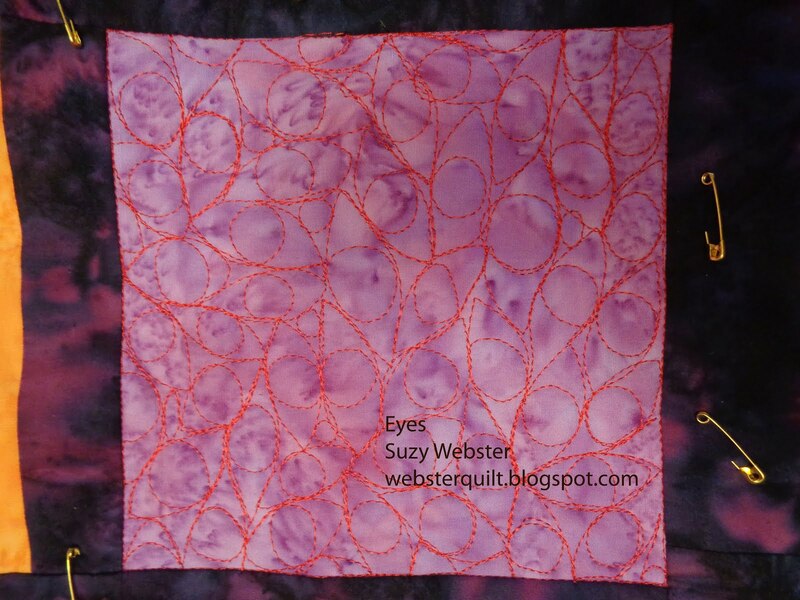 If you've been following my blog for awhile you have seen what I referred to as Blog Quilt #1, the project that started it all. 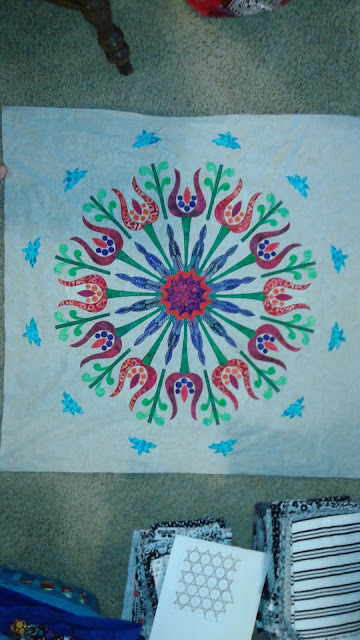 Here's the front before it was quilted. And here's a peek at the back. More in October when in debuts! Welcome back to Free Motion Fridays! You can find all the past designs in the link at the top of my blog. Today we're doing Flower Circles. I had a lot of fun working on this design. 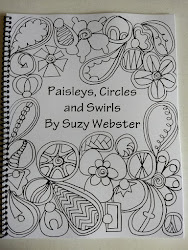 My biggest hint is to make your circles fairly large! You can download the written directions here. 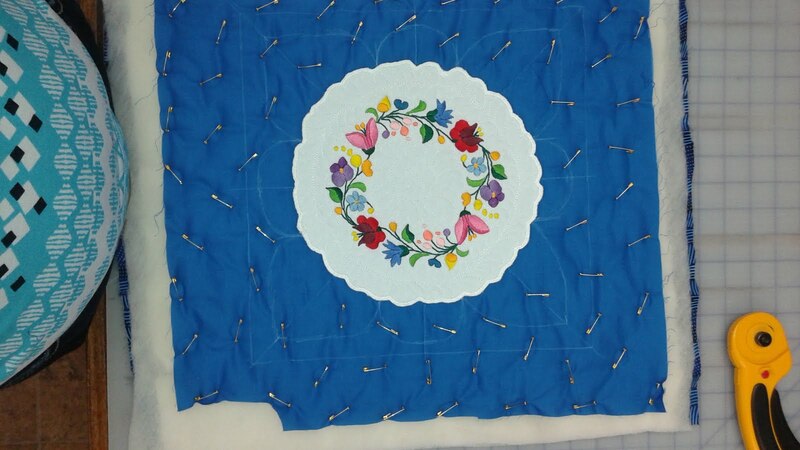 Start by making a large circle about 2 inches or so in diameter. Then stitch a small circle about 1/2 inch in diameter inside the circle. 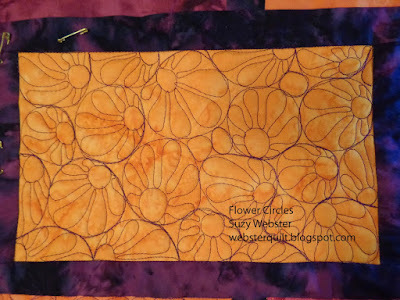 Then backtrack part of the circle, then make curvy flower shaped petals coming off the inside circle. These petals will be smaller near the inner circle and grow wider until they touch the outer circle. Make sure to practice drawing a lot of these to get the feel of the motion. 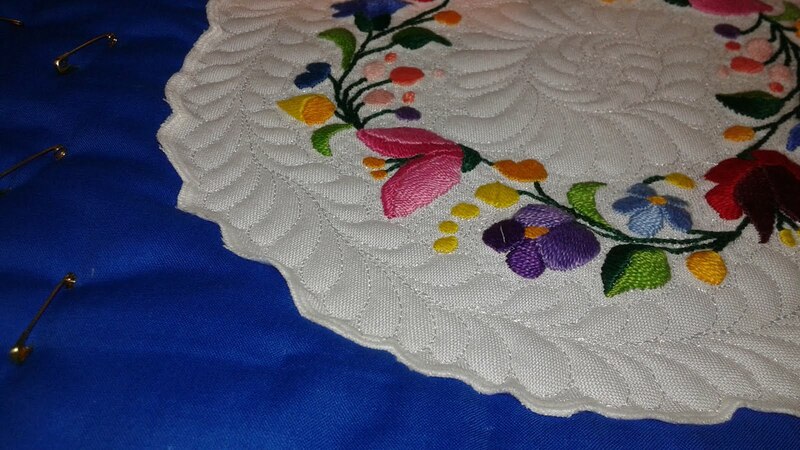 Here you can see that I decided to make a half of a circle at the edge of the fabric. It works the same way, but travels along the edge when you get there. 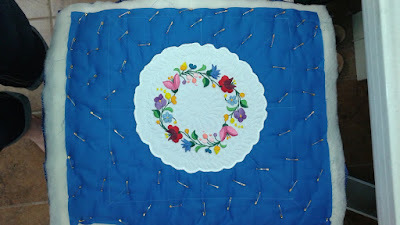 Here is a Flower Circle competed in the corner. 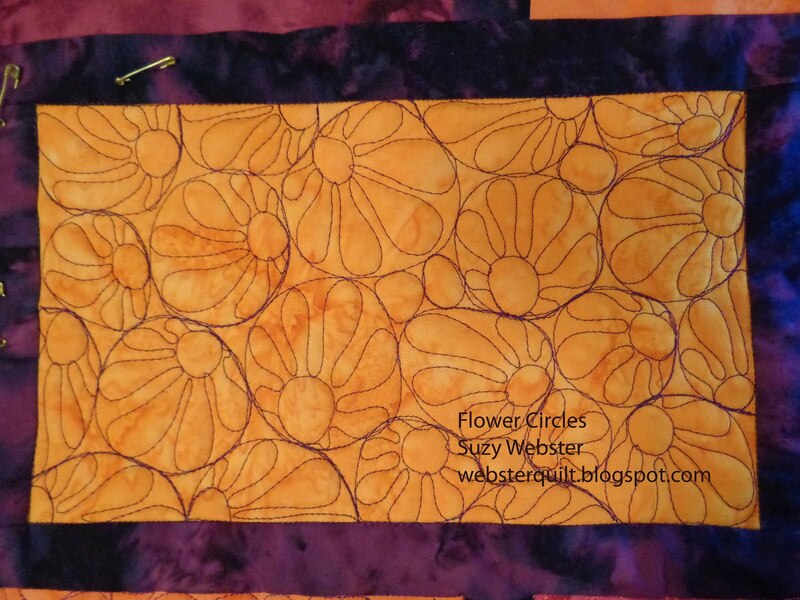 When you finish a circle, backtrack to where you want to start the next one and again make a big circle, a small circle, and then add petals. You can see that the circle below isn't really circular. It worked out okay being and oval. Almost done! You can see there are many partial circles near the edges. Here I had a small amount of space so I simply added to pebbles to fill it up. Do those two pebbles stick out in the final design? Nope. All is good. 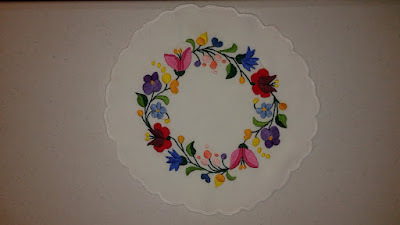 I hope you'll come back next week and share your photos on my Machine Applique Adventures Facebook group! Make sure to comeback next week! Big things will be happening here on the blog! One of my life's dreams was to go to Hungary with my mother and grandmother. 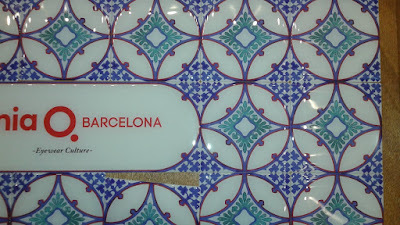 They were both there and emigrated when my mother was only 5 years old. I had that chance last summer and the memories are treasures I will never forget. 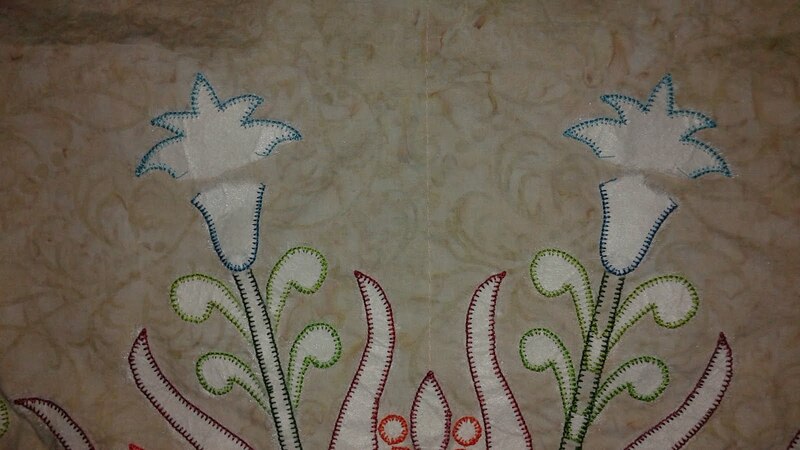 One thing I found fascinating about Hungary was the embroidery. It's stunning. I've seen Hungarian Embroidery and folk art before at my mother's knee, but I'd never seen so much at once! I purchased some items at the Market Hall. 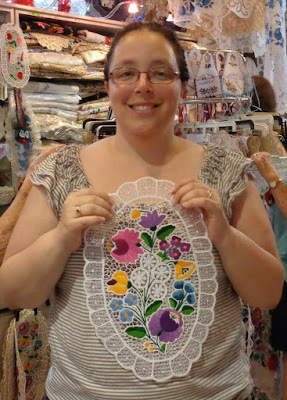 Down the street from the Market Hall we happened upon a store that sold Hungarian Embroidery kits! I was thrilled. The shop wasn't open, but a cousin of my mom's purchased this for me and gave it to me later. I spent some time stitching it up and then what to do with it. That's when I stumbled upon Kelly Cline's Quilting Vintage Facebook Group. Then I knew the answer! Turn it into a small quilt! 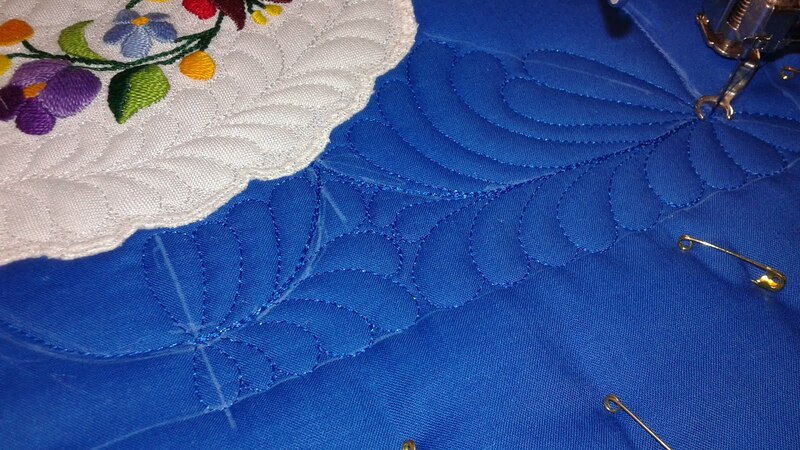 I chose a blue background because it complements the embroidery without taking away from it. Now it was time to quilt! 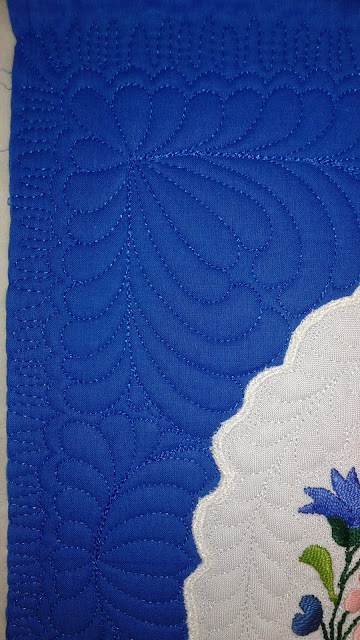 I decided to quilt feathers in most of the white space and then stipple really close around the embroidery itself. 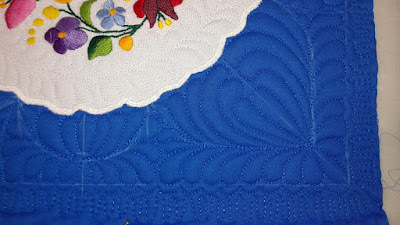 I quilt using an open toe foot and a couple of times it got caught in the embroidery. Here you can see the feathers a little better. 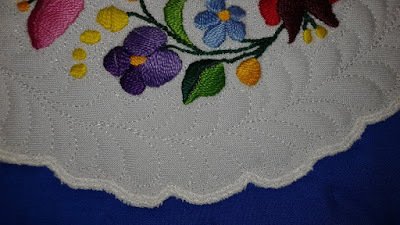 I also did a simple stipple over the edge of the embroidery as well to hold it down. 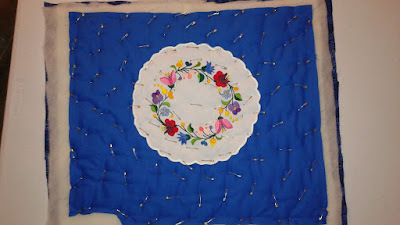 The next thing to do was to decide how to quilt the rest. I knew I wanted to do more feathers and that I didn't want to mark them. I must admit that I am a bit of a perfectionist and I am trying to break out of that box with my feathers and not mark as many of them. I decided this was a good opportunity to practice this idea. So I drew some lines with my favorite Clover White Marking Pen. The first set of lines is the outer boundary and reference lines. The lines below are my spines for my feathers. The start of the feathers! Here it is all quilted up! I couldn't be more pleased. You can see that I've done some lines at the edge. This will be under the binding and keep it the same density at the edge of the quilt. I love feathers. I will never get enough of them! I like to add an outline around my feathers to make them stand out more. 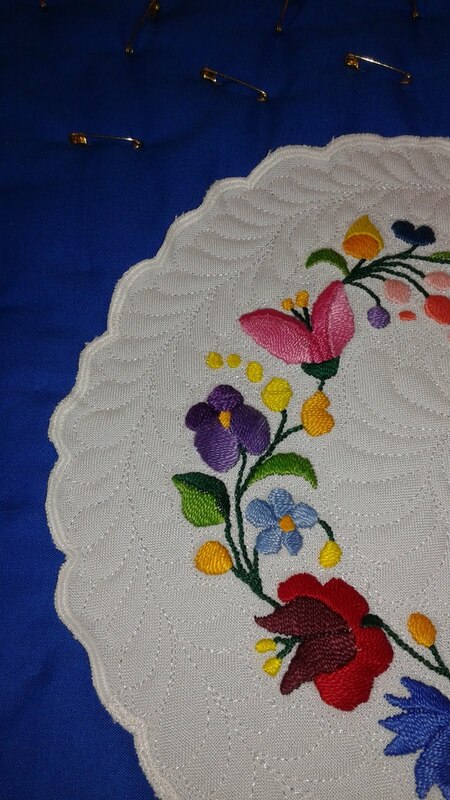 Besides being a blast, Hungarian Embroidery was the inspiration for my new book Folk Art Quilted Traditions. Check it out on Amazon or the American Quilter's Society Website! About 10 years ago I was introduced to Izzy's Ice Cream on Marshall Avenue in St. Paul, Minnesota. One of the best things about Izzy's is they make dairy-free ice cream so my mother can have fresh ice cream too. It's a drive, but a few times a summer we drive up there for a treat. I took this first picture near where I parked. 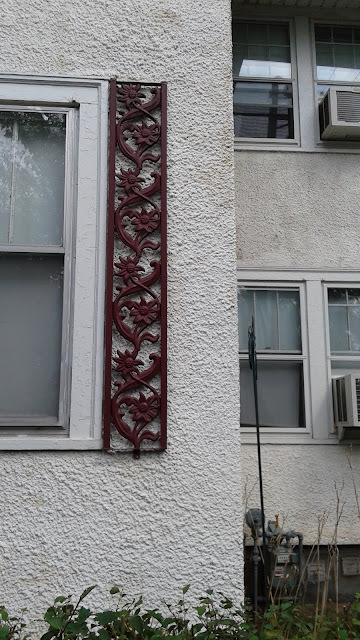 The windows on this house had great ornaments running alongside them. It would be a fabulous applique or quilting pattern! So I had to take this picture from a car window, but look at the glass on the walls of the bus stop. It's a great pattern! Time to finish this top! I can't wait to see what it looks like all together. The next step was to add some blue dots at the end of the green stems between the tulips and the blue pieces for the bottom of the outer flowers. 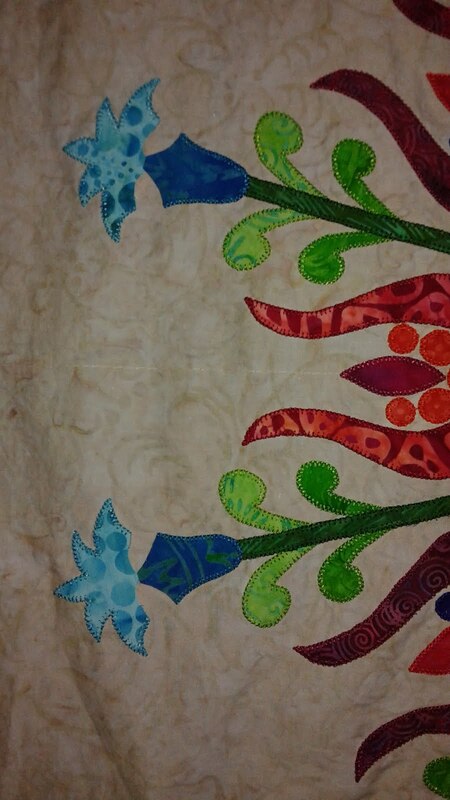 I really like the blue batik I used for the bottom of the flowers. Dark teal is a gorgeous color. However, I tested all these fabrics before starting to make sure they didn't bleed. This dark teal was the worst. I had to wash it in Synthrapol five times before it stopped bleeding. It was worth it however as it's such a gorgeous fabric! On the back here I ripped off the top part of the stablizer since I knew I was going to have to add another piece when putting on the last pink petal of the flower. And here it is! 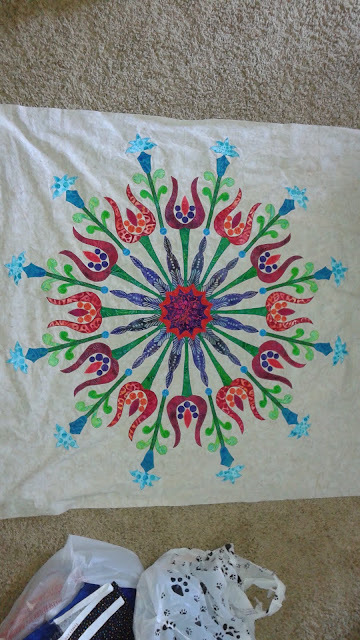 My finished quilt top for Floral Kaleidoscope! I can't wait to layer it and start quilting. Here's a close-up of the outside. Today's design is Eyes. I have no idea where this idea came from, but I was doodling during my son's violin lesson and there it was. 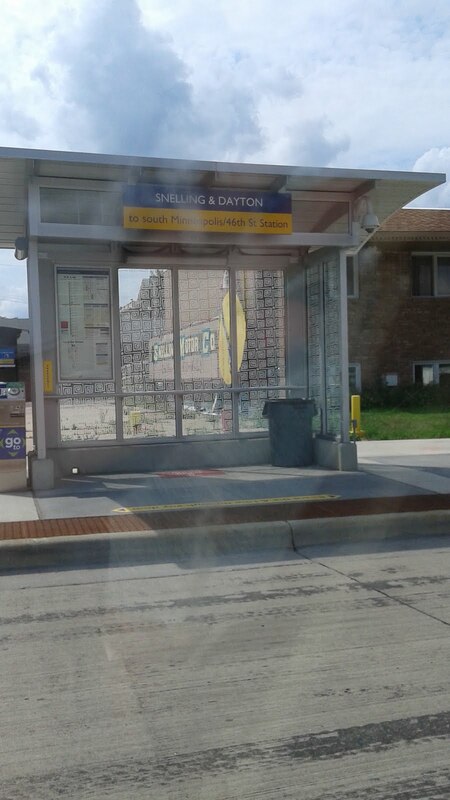 The written directions are here. I must admit I procrastinated this week because I had to unpack my classroom (I teach 3rd grade) in a new building and it's consumed a lot of time this week. And when I went to video tape tonight, dead battery. Oops. I'll try to get that uploaded as soon as I have battery power back! Here are my photographs of the process. Start by stitching in the ditch around the rectangle. Start by making an eyeball shape, or marquis shape. 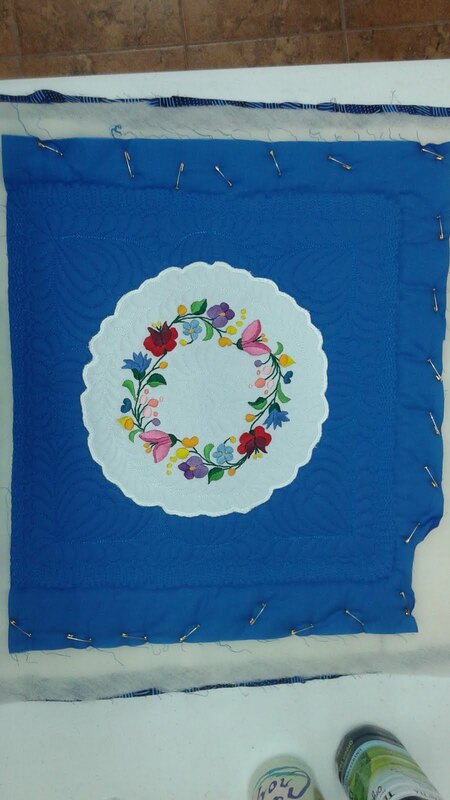 Then travel along one edge to the middle and stitch a circle. Then travel to where you want to start your next shape. Here's what I did when I came to the edge of the rectangle. Almost half done! If you make all the eyes come together at a point they could make a pretty flower. I didn't do it, but it occurred to me. Just a little more to go. If you look in the center of the picture you can see a couple small little circles. I ended up with some larger triangular spaces I wanted to fill so I threw in a little circle. You don't have to, but I wanted to fill the space. All done! I hope you like the Eyes. See you next Friday for some more free motion fun! 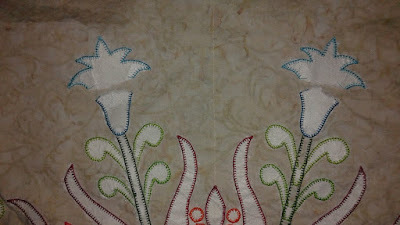 Don't forget to share what you've been doing with your sampler in my Machine Applique Adventures Facebook group!